The proportion of patients who were discharged alive from hospice care rose about 50 percent between 2002 and 2012, according to a Post analysis of more than 1 million hospice patients’ records over 11 years in California, a state that makes public detailed descriptions and that, by virtue of its size, offers a portrait of the industry. This vast growth took place as the hospice “movement,” once led by religious and community organizations, was evolving into a $17 billion industry dominated by for-profit companies. Much of that is paid for by the U.S. government — roughly $15 billion of industry revenue came from Medicare last year. California provides a portrait of how hospice profits have grown. At AseraCare, for example, one of the nation’s largest for-profit chains, hospice patients kept on living. About 78 percent of patients who enrolled at the Mobile, Ala., branch left the hospice’s care alive, according to company figures. As many as 59 percent of patients left the AseraCare branch in nearby Foley, Ala., alive. And at the one in Monroeville, 48 percent were discharged from the hospice alive. “It was definitely good news,” said Bessie Blount, whose father received hospice care from the Monroeville outfit and left after about a year, she said. 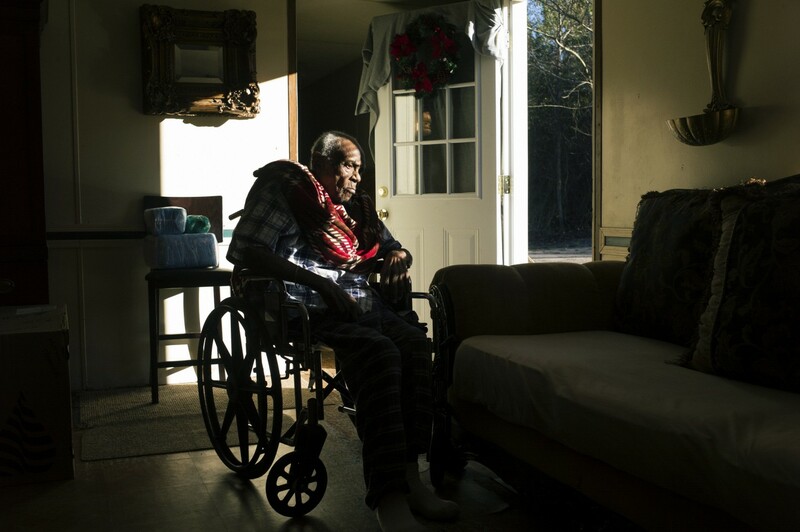 About three years later, her father, Chocolate Blount, 91, is still alive. “He has good days and bad days,” she said. The work that the hospice nurses, aides and counselors do, often in the most trying circumstances, is demanding, emotionally and physically. It typically allows patients to die at home or in other familiar surroundings — and for families of the dying, the comfort it offers can provide enormous relief. But the survival rates at AseraCare are emblematic of a problem facing Medicare, which has created a financial incentive for hospice companies to find patients well before death. Medicare pays a hospice about $150 a day per patient for routine care, regardless of whether the company sends a nurse or any other worker out on that day. That means healthier patients, who generally need less help and live longer, yield more profits. The trend toward longer stays on hospice care may be costing Medicare billions of dollars a year. In 2011, nearly 60 percent of Medicare’s hospice expenditure of $13.8 billion went toward patients who stay on hospice care longer than six months, MedPAC, the Medicare watchdog group created by Congress, has reported. But much of the data suggests that the trend toward longer stays is a response to the financial incentive. Consider the difference between the nonprofit and for-profit hospices: While the average nonprofit serves a patient for 69 days, the average for-profit hospice serves a patient for an average of 102 days, according to MedPAC. Moreover, multiple allegations have arisen from former hospice workers who say that the businesses took in people who weren’t in declining health. Four of the 10 largest hospice companies in the United States, including Asera­Care, have been sued by whistleblowers alleging that patients were receiving care they didn’t need. The Justice Department has joined several of these lawsuits, including the one against Asera­Care and Vitas, the nation’s largest hospice provider. Jim Barger, a lawyer in Birmingham, Ala., who has filed several of the suits, said the root of the problem is that a company profits when it admits patients who aren’t dying, and it is the hospice itself that helps determine whether a patient is dying. While two doctors certify a patient for hospice care initially, the patient must periodically be re­approved for hospice care. The reapprovals typically are done by hospice physicians. For five years, Medicare’s watchdog group has been recommending that the payments to hospice companies be revised to eliminate the financial incentive for improper care, but Medicare has not yet done so. To ensure that patients are appropriately selected for hospice care, Medicare relies on strict medical documentation requirements, a spokesman said. The hospice industry is opposed to fundamental changes to the payment system. Jonathan Keyserling, senior vice president of health policy at the National Hospice and Palliative Care Organization, an industry group, said that the current payment system is sound and that tampering with it could have unintended consequences. He noted that two doctors certify a life expectancy of six months or less for hospice patients. As for the whistleblowers, Keyser­ling said that they, too, have financial incentives. “I don’t know what motivation might prompt a whistleblower suit, but obviously there is a monetary reward — the larger the program, the larger the reward,” he said. Moreover, Keyserling and others in the industry attribute the rise in the number of hospice survivors to changing patient demographics, not fraud: A larger portion of patients today have diseases whose outcomes are harder to predict. That’s because the portion of hospice patients suffering from cancer, a disease that has a more predictable course, has shrunk, they said. cancer ailment began staying longer on hospice: Their average stay in hospice care grew from six weeks to almost 11 weeks on average between 2002 and 2012. While the lawsuits against the for-profit hospices vary in the details, as a whole they depict an industry in which companies compete for new patients and provide services to patients who are not eligible for them. Hospice “outreach specialists” and “community education representatives” seek out patients in a variety of ways: They solicit doctors and hospitals who might regularly deal with the terminally ill; they make connections at nursing homes, assisted-living developments and Meals on Wheels groups. They show up at the “health fairs” held at senior centers with, for example, machines that test blood pressure. For families struggling to take care of a loved one, they offer the promise of extra help. “Effective communication is the transfer of emotion, not information,” the presentation said. At Odyssey Healthcare, one of the nation’s largest hospice companies, representatives earned bonuses if they met their goals for new patients, according to that complaint. The case led to a $25 million settlement with the company. At Vitas, a division of Chemed, a company that also owns the Roto-Rooter plumbing service, the corporate culture encouraged staff members to admit as many patients as possible, regardless of whether they were eligible for hospice care, according to the lawsuit. The lawsuit said the company paid bonuses based on the number of patients enrolled. One former manager said that the company philosophy was “sign everybody up” and that medical staffers felt pressured to admit patients regardless of whether they were appropriate. And at Angels of Hope hospice in LaGrange, Ga., audio recordings cited in the complaint described how some salespeople found patients: by cruising neighborhoods, looking for elderly people with disabilities. AseraCare denied the allegations outlined in the lawsuit initiated by whistleblowers at the company. “AseraCare provides an important and valuable service to patients and their families facing difficult end-of-life decisions,” the company said in a statement. “Our policies and programs comply with the Congressional intent of the hospice benefit to reduce the stress and anxiety of the end of life of a loved one,” the company said. The company declined to identify the doctors who certified the patients in Alabama. A spokesman for Angels of Hope similarly denied the allegations made by the whistleblower, as did representatives of Vitas. Medicare began paying for hospice care in 1983, following a resurgence of interest in end-of-life care, sparked in part by the publication of “On Death and Dying” by Elisabeth Kubler-Ross. “We can give families more help with home care and visiting nurses, giving the families and the patients the spiritual, emotional, and financial help in order to facilitate the final care at home,” Kubler-Ross testified to the Senate Special Committee on Aging in 1972. The government benefit, while costly in itself, promised other compensating savings for Medicare: Patients would be choosing home care rather than expensive end-of-life medical treatment. The treatment of a hospice patient typically focuses on treating pain and symptoms, rather than grasping at a cure. The hospice patient, who is most often living in a private residence or nursing home, receives visits from nurses, aides, social workers and others. The benefit was quickly embraced by Americans and continues to grow, with Medicare paying for hospice care for more than 1.2 million people annually. In 2000, Medicare spent $2.9 billion on the hospice benefit. By 2012, that figure has risen fivefold, to $15.1 billion. But as more Americans have taken up hospice care, a profound change has been underway: Big businesses have moved in. When Medicare paid its first hospice benefit, the vast majority of hospice-care providers were nonprofit groups. Over the past decade, however, the for-profits have come to dominate the industry. In 2000, 70 percent of hospices were run by nonprofit organizations or government agencies. Today, nearly 60 percent are for-profit companies, and they may account for an even larger share of patients. The profits appear to be substantial. The profit margins as measured by MedPAC, the Medicare watchdog, climbed to 8.7 percent in 2011. The per-patient operating profit has risen from $353 in 2002 to $1,975 in 2012, according to the analysis of California data. The returns have attracted some prominent financial firms, whose analysts have run the numbers and decided to invest. Among the private investment companies that have put down bets on hospices in recent years are Kohlberg Kravis Roberts & Co., KRG Capital Partners and Summit Partners. The vast majority of those profits flow from the U.S. government and Medicare, which makes an estimated 85 to 90 percent of all payments to hospices. Those payments — and specifically the incentives that they offer — have drawn criticism repeatedly from government watchdog agencies. “Several aspects of the hospice per diem payment methodology may not reflect how hospices currently deliver services,” the Government Accountability Office reported in 2004. It noted, too, that the payment rate was about 10 percent higher than costs. Indeed, it has been an open secret in the industry that, because of the method of payment, the way to run a hospice profitably is to enroll patients who stay for a long time. Hospices noted that while some hospice patients prove not to be terminally ill, patients sometimes drop out of hospice care to seek a cure, and other times to change providers, factors that can be out of their control. Karla Wicks, a spokeswoman for Delta, said in a statement that the company provides the highest level of training to its staff and is committed to strict compliance with Medicare guidelines. The company is unaware of any employee who left the company because of being asked to sign up people who weren’t appropriate for hospice care, she said. The reason that longer stays are more profitable is that hospice companies typically spend more on patients at the beginning of their care and then again at the end of their lives. When a patient is first enrolled, the hospice often must diagnose the patient’s illness, set up home equipment and get them stabilized. Then, during the last week of life, a hospice typically must pay for more frequent home visits by the nurse, aides and others. As a result, patients who live a longer time — and for whom there is a long, stable period in the middle — generate more profits. In 2008, MedPAC, the Medicare watchdog, noted that hospices were enrolling patients with diseases that were harder to define, resulting in long stays. Again in March 2009, MedPAC noted that the payment system favors patients with longer stays. “Our findings suggest that Medicare’s payment system for hospice needs to be significantly revised so that hospice care. . . is appropriate,” it reported. Medicare has responded with measures that might make it more difficult for hospices to enroll ineligible patients. In 2009, Medicare added a requirement that the physician, in recommending a patient for hospice care, must include a brief narrative explanation to support a life expectancy of six months or less. In 2010, the agency added a requirement that a physician or nurse practitioner determine a patient’s continued eligibility for hospice in a face-to-face visit. Next year, the agency will limit the use of vague categories when describing the ailments of hospice patients, specifically prohibiting the use of “debility” and “adult failure to thrive” as primary diagnoses. And all along, Medicare has capped the average amount of money a company can make on a patient — currently about $25,000 — which amounts to about 180 days of routine care. This is not a per-patient limit but is averaged over all of a hospice’s patients. Despite these rules, however, the number of long stays has not been reduced, according to the California data, and because of the large sums of money at stake, MedPAC in June added a sense of urgency to its recommendation. “Given the magnitude of hospice spending devoted to long-stay patients, who are more profitable under the current payment system than other patients, it is important that an initial step toward payment reform be taken as soon as possible,” MedPAC wrote. A spokesman for Medicare said the agency is considering hospice payment reform but that no such changes will happen in fiscal 2014. “While the Medicare hospice benefit provides a choice for beneficiaries to seek the care that best meets their care needs and desires, Medicare has and will continue to take actions to safeguard this benefit from inappropriate use,” said Jonathan Blum, principal deputy administrator of the Centers for Medicare and Medicaid Services, said in a statement. One of the primary lawsuits against AseraCare was initiated by Dawn Richardson, a clinical manager at the company, and Marsha Brown, the former executive director at the company’s Monroeville, Mobile and Foley, Ala., outlets. There was steady pressure for AseraCare managers to find more patients, the lawsuit said. An executive who did not meet a quota was penalized, according to the lawsuit, and the company offered a massage chair for the person who brought in the most hospice patients. “We had a director who would be like, ‘Get a patient, get a patient, get a patient,’ ” Michael Bonham, a Lutheran minister who worked as a chaplain at the company in Alabama, said in an interview. He is not a party to any of the lawsuits. These demands for patients were sometimes met with people who were sickly but not dying, according to the federal lawsuit, which outlines five examples. One patient was supposed to have had end-stage heart disease and thus would have had trouble breathing and walking, according to the lawsuit. He left the nursing home for his granddaughter’s graduation and for Christmas, had a good time and ate a lot, according to notes from hospice workers cited in the lawsuit. Another, diagnosed with end-stage “debility,” was not losing weight as is typically the case, according to the legal filing, and instead went out for a trip to Wendy’s and another to go birdwatching. Finally, according to the lawsuit, when the hospices were making too much from patients — and running into the cap on payments imposed by Medicare — Asera­Care would take extraordinary measures to bring their numbers down. The company “dumped” patients from its rolls, telling them they were no longer eligible, according to the lawsuit. In some cases, hospice recruiters even specifically sought out “last-breath” patients — those who would die quickly — to bring their average down, according to the lawsuit. “AseraCare denies the allegations in the case and looks forward to the opportunity to have all of the facts presented and considered by the Court,” company spokeswoman Kelli Luneborg said in an e-mail. She noted that the original lawsuit from Brown and Richardson has been dismissed. But that was done at the request of Brown and Richardson, their attorney said, and it was done to consolidate three federal suits against the company. The federal suit makes substantially the same claims. Chocolate Blount’s family said they miss the help that hospice provided but noted that he didn’t really seem to be dying.